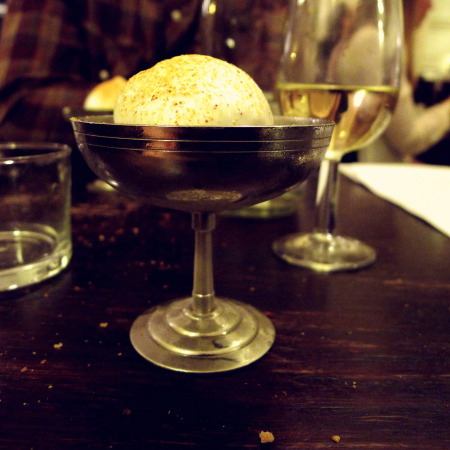 As the final installment of posts about what we ate in Paris, I present a very happy accident. Imagine my surprise when, searching for our airbnb apartment, the words 'Le Chateaubriand' caught my eye. But could this be THE 'Le Chateaubriand'? Right next to our place? And further surprise when I entered to grab a reservation (managing to get the last open table they had before we left), and I found out the tasting menu at this top 20 restaurant was 60 euros. 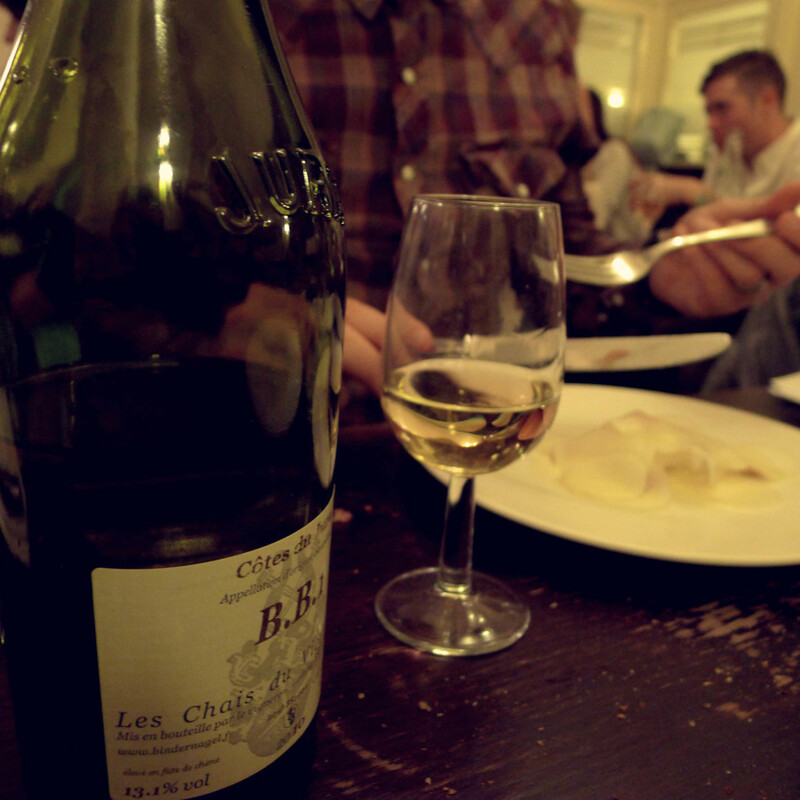 The night of our meal, as honorary Spaniards, we took our 5-year-old Buckley with us to dinner. 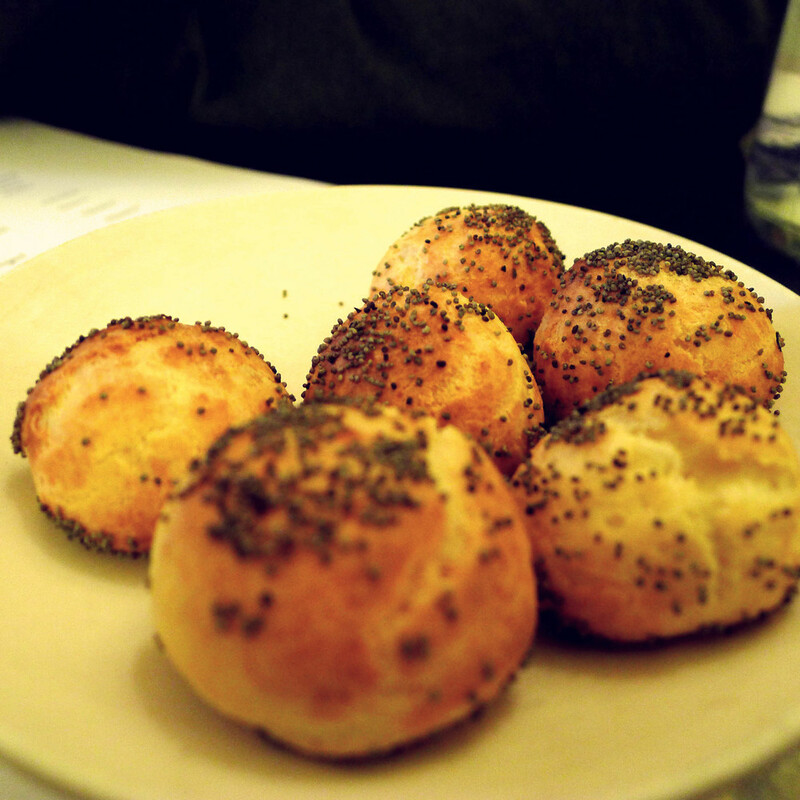 She was delighted by the gougeres that they served as amuse bouche. What she wouldn't try were the raspberry dusted fried shrimp. Curious, I tried one. I'm not normally of the dried/crunchy seafood persuasion, but these and their touch of sweetness were AMAZING. Once you pop you can't stop. 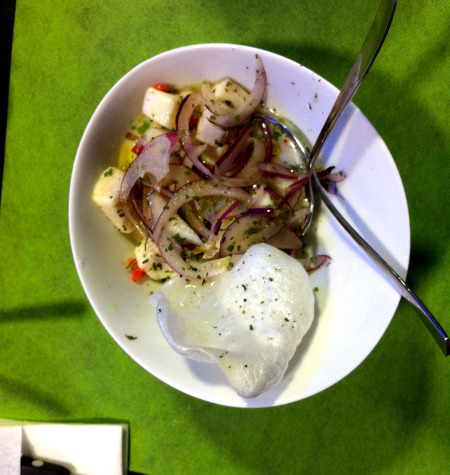 Then a tiny shooter of ceviche in which the liquid was really the star. 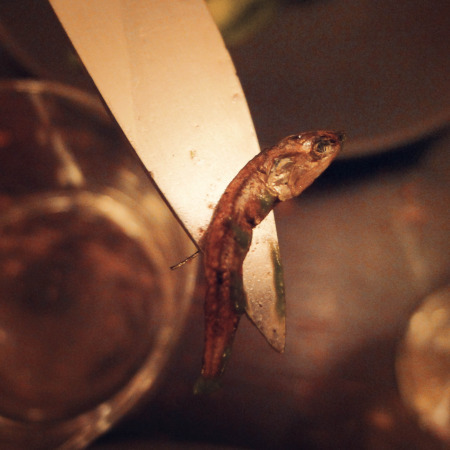 A tiny, perfect chunk of lightly cooked fish. This is when Mugaritz first popped into my mind, and it turns out that Iñaki Aizpitarte, the chef/owner, is Basque and counts Mugaritz as "the best dinner of my life." Hmmm. Of the next dish I was suspicious at best. Trout with carrots and grapefruit ice. Either really good or really bad, right? Fortunately it was the former. Then, delight of delights, Iñaki finally started to act Basque. Enter....marmitako, that rustic Basque soup perfect for cold, semi-rainy days. Iñaki's version was refined, featuring roasted vegetables and crispy potato. To cleanse the palate, a herring broth with celery that brought to mind miso. Then, the turbot. So delicious. It came covered in thin potato slices, tender to the fork, sprinkled with almonds. That fish. That fish. I will not soon forget how tender and perfectly cooked it was. And, the last dish, the boeuf. I was definitely feeling good about the 60 euro price tag even before this plate. This surf and turf dish combined a perfectly cooked piece of beef with springy green asparagus and the babiest of baby anchovies. Then, dessert...a beautiful rendition of tocino del cielo, the Spanish dessert of egg yolks and caramelized sugar with a meringue base. 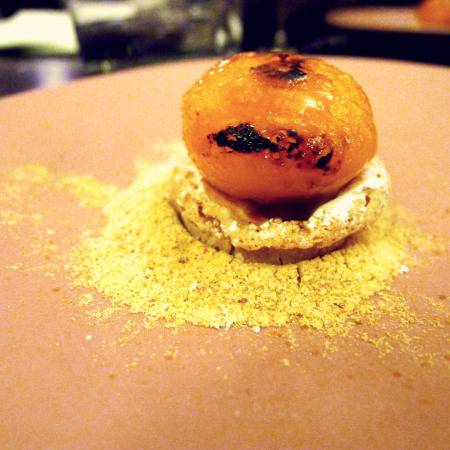 The exploding "egg yolk" was Iñaki's only real nod to trends from molecular gastronomy like spherification. Then a rum-raisin ice cream with a nice alcoholic kick. In silver goblets, in tune with the classic French feel of the place. Iñaki and his team have an exquisite aesthetic and eye for detail. A famed French paper recently ranked Iñaki right after Michel and Sébastien Bras as the best chef in France. His response? "All that means nothing to me as being ranked like that will never change the way I work. 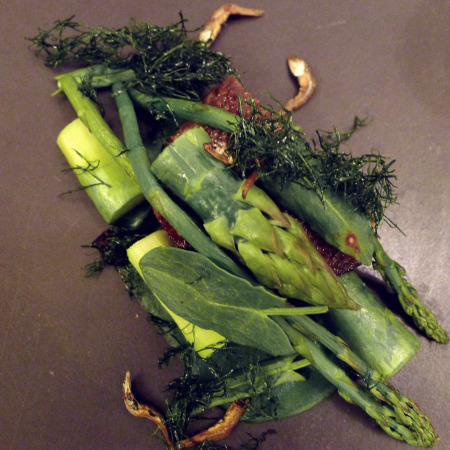 In my opinion, the best restaurant in Paris is far from luxurious - it is the Baratin, in Belleville, where Raquel Carena cooks food which I relate to." What can I say? I'm American; I'm a sucker for democracy. And even more of a sucker for great food.